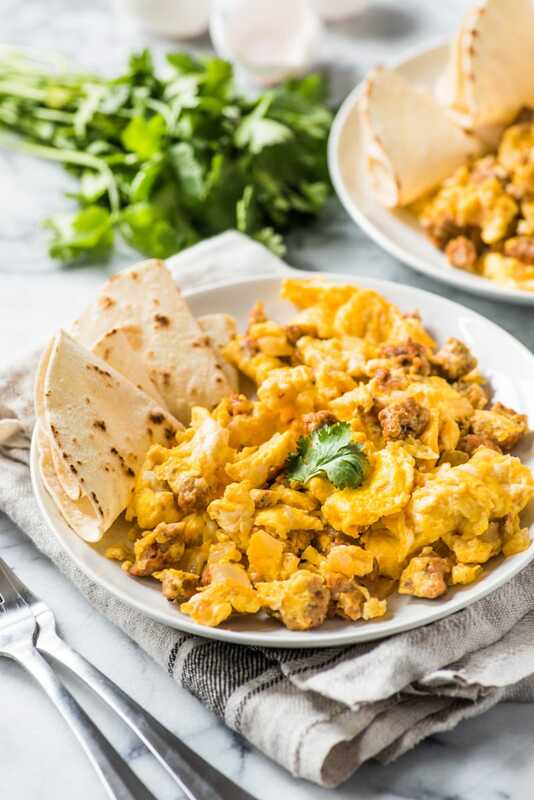 One of my all-time favorite breakfasts my dad used to make when I was growing up was Chorizo and Eggs. It’s flavorful, savory, really filling and so easy to make! Basically everything I could ever want in a breakfast. On weekend mornings whenever he’d come home from grocery shopping and picking up the local newspaper, I’d always wait to see what he’d picked up at the store because if it was chorizo I knew he’d offer to make me some. Chorizo, specifically Mexican chorizo which is what we’re using in this recipe, is a slightly spicy pork sausage seasoned with chili powder, garlic, cumin, oregano and other Mexican herbs and spices. It’s sold fresh, uncooked and usually in links. Recipes often call for it to be removed from the casing, crumbled up and browned. What’s the difference between Mexican and Spanish chorizo? Mexican chorizo is fresh and uncooked and can be found with the other raw meats in the grocery store. Spanish chorizo is a pork sausage seasoned with smoked paprika and is cured, dried and ready to eat immediately. It’s often found next to the other cured meats like salami and pepperoni. 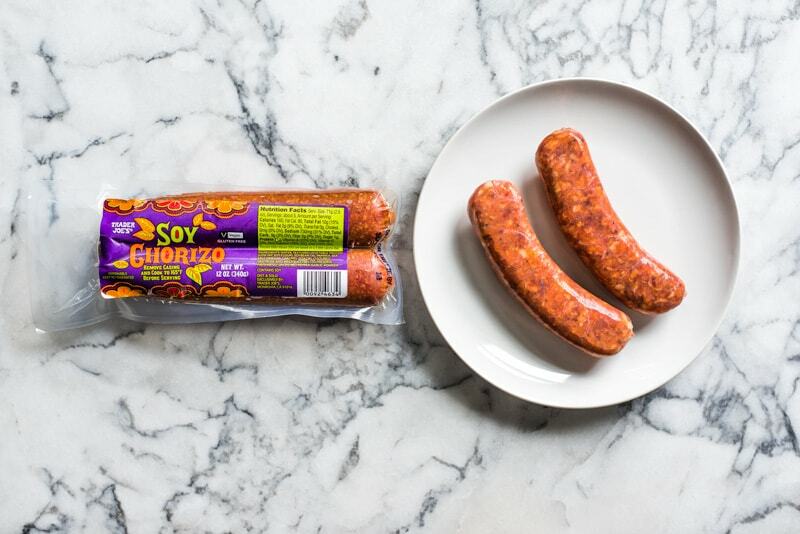 Once you’ve got your Mexican and Spanish chorizos sorted out, you’ll soon find that different stores carry different kinds of Mexican chorizo. Let’s start with the chorizo I know and love. Rich and succulent chorizo – this is the type of chorizo I grew up eating and it’s SO GOOD! 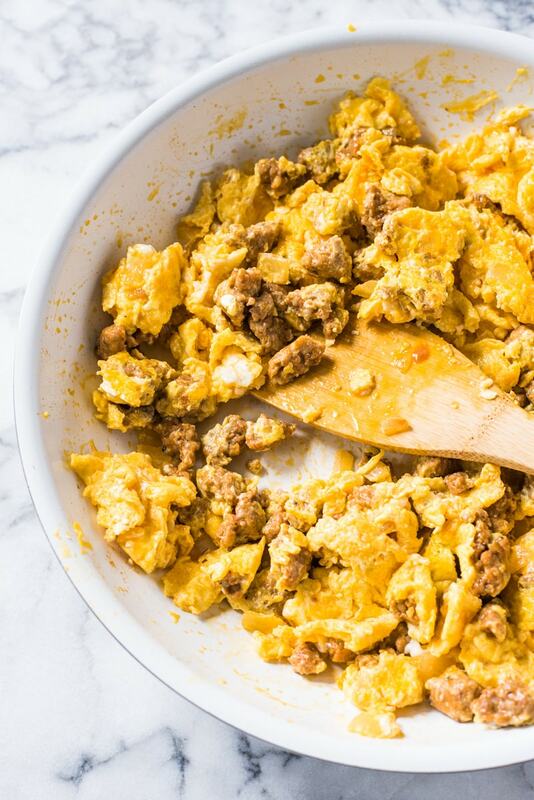 My dad always picked up the Cacique brand of pork or beef chorizo at the local Mexican grocery store and that’s what we ate with eggs. Today it can be found in some major stores like Walmart and at most specialty Hispanic grocery stores. This is the chorizo I go for when I’m really missing home and want that absolute authentic Mexican flavor. Meaty, protein rich chorizo – this is the type of chorizo that my local grocery store in Pittsburgh carries. It’s meatier and isn’t as fatty and rich as what I grew up eating, but it still has that great strong chorizo flavor that I know and love. This is the chorizo I go for when I don’t feel like driving a half hour to pick up the Cacique chorizo. Vegan chorizo with all the flavor – I found this soy chorizo from Trader Joe’s about a year ago and I fell IN LOVE. It has all the same salty and spicy flavors of the chorizo I grew up with, but it’s made of soy so all my vegetarian friends can enjoy! This is the chorizo I go for when I’m serving it to any of my vegetarian friends. Now let’s get to the easy part – how to actually make this dish! First, heat a large skillet over medium high heat. Add in some olive oil and chopped onions and cook until the onions are translucent and soft. I like adding some onions to my morning scramble, but you can leave it out if you prefer. It won’t affect the dish too much. Next, remove the casing from the chorizo and add it to the skillet. Using your spatula, crumble up the ground meat into little pieces. For this recipe, I used the “meaty, protein-rich” chorizo so you definitely have to break it up a bit. If you use the traditional Cacique chorizo or the soy chorizo from Trader Joe’s, the protein is usually broken up a lot already so you don’t have to mess it with too much. Cook the chorizo all the way through. At this point, if the pan is really greasy, you can drain off any excess fat into a glass container if you’d like. Last but not least, add in the beaten eggs and mix them up with the chorizo. I like to let it sit for about 30 seconds to let the eggs start to adhere to the protein and then gently stir until the eggs are just cooked through. Remove the eggs from the heat and then serve! 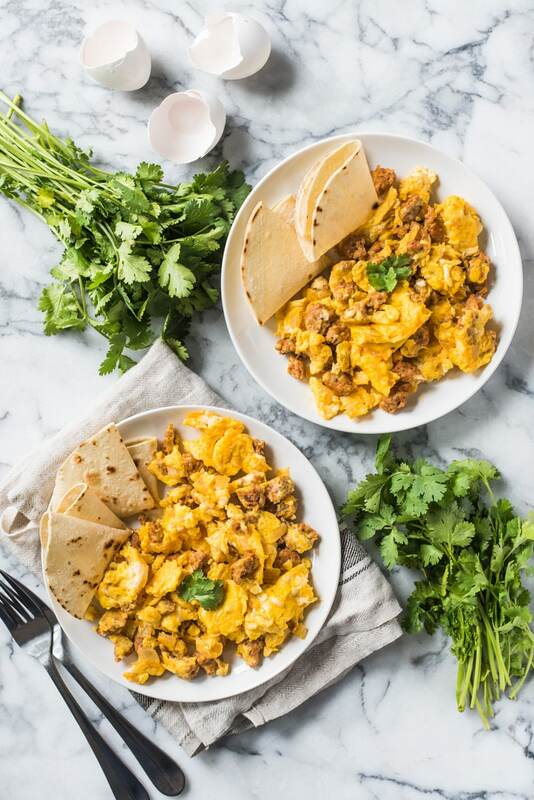 I like to eat my Chorizo and Eggs with a simple side of corn tortillas, but if you’re serving this for a big crowd or just want to jazz it up a bit, here are some food pairing suggestions. Heat a large skillet over medium-high heat. Add the olive oil and chopped onions. Saute for about 5 minutes, until the onions have softened and become translucent. Remove the chorizo from the casing and add to the skillet. Using your spatula, crumble it up into little pieces and saute until fully cooked through, about 8 to 10 minutes. If the chorizo is super fatty and let out a lot of grease, feel free to drain off any excess fat. Add the beaten eggs along with a pinch of salt and pepper. Stir the eggs into the chorizo mixture and let cook for about 30 seconds. Then continue gently stirring until the eggs are just cooked through. Remove the pan from the heat and serve immediately with corn tortillas and other Mexican favorites like queso fresco, a dash of spicy salsa or refried beans. *If using Trader Joe's soy chorizo, I recommend using half the package, about 6 ounces. Tried this recipe for DH as he was gifted some chorizo from work! He LOVED it this am!